More remarkable, maybe, is that only a mile from Blaine is Audubon Elementary, where “exceeds” scores have increased from barely 1 percent to nearly 16 percent among low-income students over the same period. And then walking distance from Audubon is Burley, whose numbers have jumped from 4 percent to more than 19 percent. 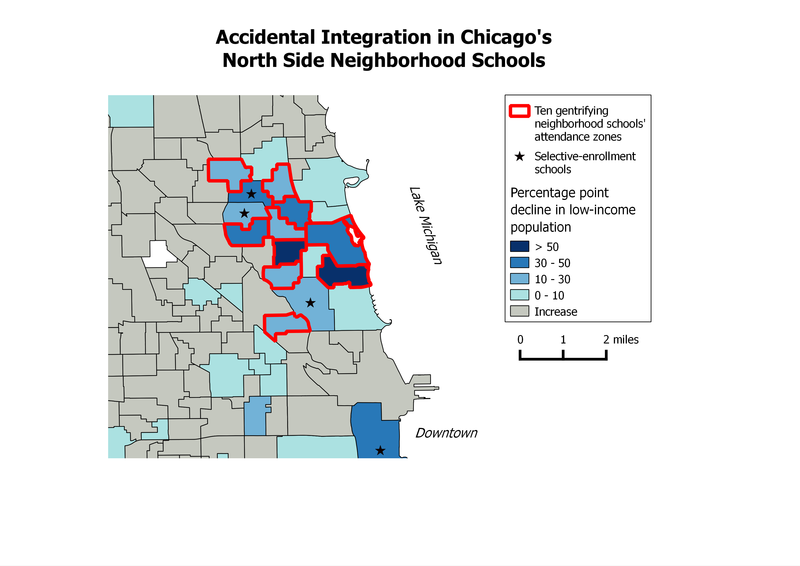 All told, there are 10 elementary schools, all clustered in the same region of the city, whose low-income students have collectively improved more than twice as fast as their peers in other public, non-selective Chicago elementaries. I can only speak to Burley, but while it’s not a magnet, a lot of out of district children were enrolled there when I lived there. It was sort of a semi-charter if you will, where motivated parents who couldn’t afford private schools would send their kids. Once you got one kid in, all the rest could go too. I think it’s harder to pull that trick today because of actual demand from the neighborhood, but I wouldn’t assume the people attending the school are all from the neighborhood. When were you there? That’s definitely something to look into; I wonder whether the WBEZ report on school choice would have numbers that would let you get a definitive answer about that. I was there 2002-2012, and it was still the case as of 2012, though I suspect the students I personally knew of there in 2012 from outside the district had gotten in (or their siblings had gotten in) a few years prior. In my humble opinion, the top five of this 10 are signficantly more gentrified than the bottom five, and averaging them all together can be a little bit misleading. Looking at the top half or where all of these may eventually be headed, it is encouraging that schools that are only 60% white are starting to achieve some really great scores. Unfortunately those Low Income % #s generally decline. I would also note that CPS Low Income Enrollment data is notoriously fuzzy and by my understanding is self-reported by parents with no verification. Aaron, most of the neighborhood elementary schools on the northside were once that way to varying degrees, and yes that is tougher to pull off today. As of this school year, Blaine, Audubon, and Waters are not accepting any out of neighborhood students (as well as Lincoln/Bell/Coonley, which all are similarly rich, white and high performing but we exclude because their data includes both a neighborhood school and a test-in gifted program, interestingly after adding a non-neighborhood test in program, all three schools were shortly overcrowded and had expansions built). Hamilton enrollment has doubled over the past 5 years. Go browse thru Zillow and you will see that in the top 5 listed above + Bell/Coonley, 3 & 4 bedroom homes regularly run north of $1M, with 2/3 bedroom duplexes in excess of 500K. Interestingly you see as people are priced out of these neighborhoods, the improvement is starting to spread to more schools (such as the bottom 5 in the ten listed). But as a thought experiment, even if you rezoned these desirable areas and built denser/cheaper housing, the schools would still be overcapacity. Thanks! And yeah, there’s definitely a good amount of difference between these ten schools. I guess I would say that I don’t see a sharp difference between the top five and the next five, at least looking at the data, but rather think of all of them as at different points along a similar continuum. And, as you say, I think there’s every reason to believe that this trend will continue, and the percent low-income and non-white will continue to decline at all ten, and in a handful of other schools on the north and northwest sides. I don’t think it’s bad for the low income numbers to decline, necessarily; if a school is 60-95% low income, that suggests a purposeful attempt at isolation, and reversing that is, I think, pretty unambiguously good. The problem would be when the numbers are so low that you’re effectively re-isolating the poor somewhere else. And yeah, school capacity is an issue. We can build more schools. We’ve done a ton of it already over the last 15 years, just in different neighborhoods. That doesn’t really bother me. Unrelated but did you catch this a few weeks ago?